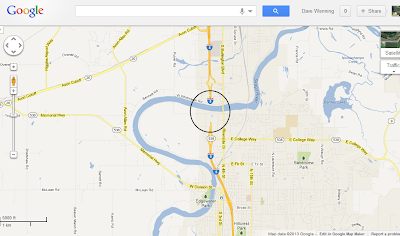 By now, everyone has heard about the collapse of the Interstate 5 Bridge over the Skagit River. As the crow flies, the bridge is about 12 miles/19 km from where I live. I found it interesting that Google is right on top of it. 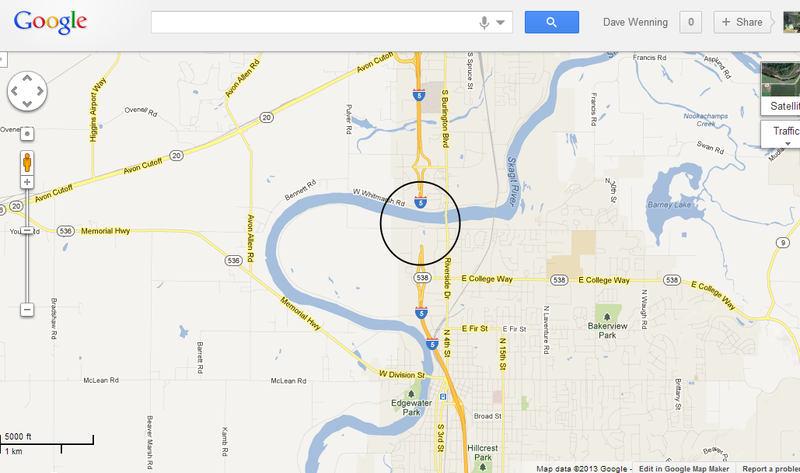 In less than 24 hours, the Google map is already showing the gap in the freeway where the bridge used to be (above). There is something else I always find interesting. Whenever the news media covers stories on subjects where I have specific knowledge, they always seem to be full of errors. For example, this article at Think Progress originally put the bridge in Seattle. They have now replace the word "Seattle" with "Washington" in the text. I wondered if they thought everything out here was Seattle, which is actually about 60 miles from the bridge. They get an F in geography and another F for lazy reporting. These mistakes make me wonder about the accuracy of all the rest of the news. Then, there is the pronunciation of "Skagit." It's SKA-jit, just like it's spelled. It rhymes with "gadget." MSNBC apparently thinks it is SAG-get or something. The name honors the Native American people who once lived where Mount Vernon, Washington is now. The route I drive to work every day is now the designated southbound detour around Mount Vernon. This means two lanes of freeway traffic will now now be travelling on one lane of country roads. This will include all of the commercial traffic between Vancouver, Canada and Seattle. I think it will be worse than the Tulip Festival, and it won't be over in a month. I'll find out tomorrow. Saturday May 25, 2013 UPDATE: Since I posted this yesterday, the WSDOT has changed the alternate detour routes around Mount Vernon (map). It includes a northbound I-5 to Anacortes ferry detour. They indicate this may change, so keep an eye on the WSDOT websites. They also have traffic cams through the Mount Vernon area which I found helpful this afternoon. Friday May 31, 2013 UPDATE: The WSDOT has added new traffic cams which include the detour routes around the bridge. This one views the bridge itself providing a look at the progress of repairs. They hope to have a temporary fix in place by mid-June and a permanent replacement by the end of the year. Components for the temporary replacement are already being assembled at the site. Wednesday June 18, 2013 UPDATE: The temporary I-5 span over the Skagit River is now open to all traffic except oversize or overweight loads! The speed limit is 40 mph through that section of the freeway, or 64 kph for our Canadian friends. Yesyesyes...to everything observed. I'm due to drive to Seattle and back tomorrow (from Anacortes), and was considering the Mukilteo ferry as an option, but the reports on that are saying 3hour wait time, too. Still considering it, though...just at different times than most would take it, say at oh-dark-thirty morning and evening instead of civilised hours. Then again, staying home looks mighty pleasant, too. Hello Els. I just drove I-5 to Anacortes via Fir Island and Best Roads. Lighter than normal weekend traffic. Sailed right through. That is no longer a designated detour route since the North Fork bridge cannot take the semi truck traffic. At 6AM this morning I drove through West Mount Vernon to I-5 south and pretty much had it to myself. Drove to Anacortes via Whidbey ferry on Friday morning, returned from Orcas on 6:45 a ferry Monday morning, didn't hit Mt. Vernon until after 9 and it was cake, cruised through downtown past the co-op etc. on the detour. Jill, early morning (around 6 AM) seems to be an excellent time to travel through the area.